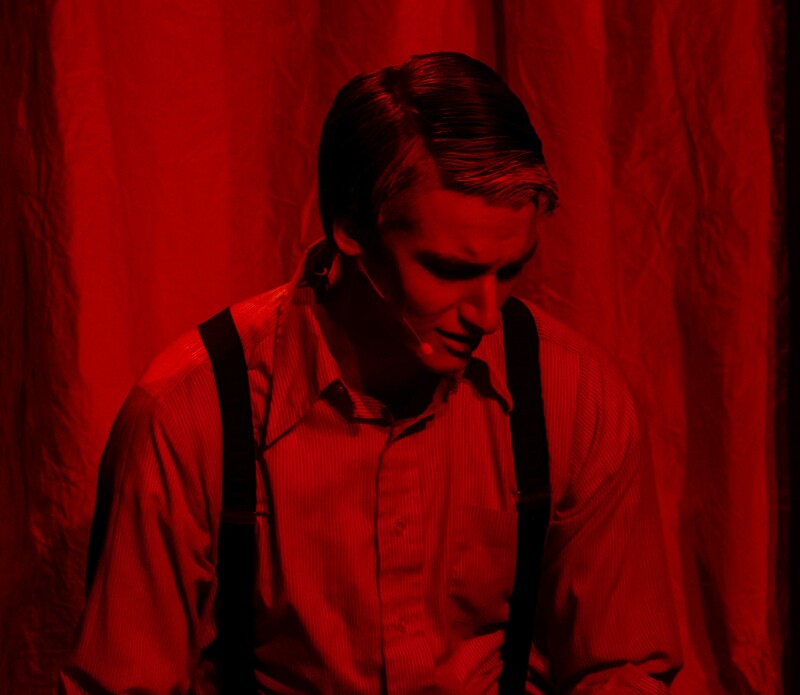 SWEENEY TODD, PLAYED by Dan Marion '19, reminisces over his tragic past. As much as I enjoyed the play RPI Players put on for An Evening of Performance, Sweeney Todd: The Demon Barber of Fleet Street was unlike anything I saw from them so far. It was an absolute riot. From the chilling prologue to the soulful finale, it had audience members terrified, laughing, enthralled, and on the very edge of their seats. Needless to say, I won’t be going to any barbers anytime soon—even though I will probably need to. Sweeney Todd, a disgraced, disgruntled widower, is back in London, ready to start his new life. But soon, dark secrets are revealed, twisted ploys are unravelled, and the guilty are sent to hell as this madman enacts his revenge with the swipe of his blade. I enjoyed how many practical effects the play had. Delivering Sweeney Todd’s chair from above using a hidden system of pulleys, bubbles falling from the ceiling during one of the musical numbers, and a suspiciously realistic looking meat grinder were some of my favorites. These are practical effects that even Christopher Nolan would be proud of. The set was impeccably made, immaculately detailed, gorgeous to behold, and cleverly thought out. Whoever did the set design needs a raise, because it was all around spectacular. What was particularly noteworthy was how every single aspect of the hall was used as a set piece, including the balcony next to the projection room being used as part of the set. The Players also made good use of the projectors they had. During musical numbers with Todd, the main character, in his office, they projected specific imagery—presumably to showcase the inner workings of his demented, evil mind. Although some of the information was rather oblique, it was an interesting idea and added to the experience. The only aspect of the play I didn’t enjoy was the ear-bleeding screech that played whenever Todd slew one of his unsuspecting victims. Apart from that, all the technical aspects of the play were perfect. Finally, the acting was beyond spectacular. Everyone who made up the main and supporting casts, as well as all the background singers, put their souls into this epic performance. The actor who played Pirelli, Bill Geltzeiler, was especially good, and gave his character just the right amount of eccentricity to coax the audience into prodigious bouts of laughter. The singing was pitch-perfect and flawlessly choreographed. As good as they are, no IMAX 3D movie experience will ever match the immersiveness of an actual play. Dolby Digital surround sound will never be able to replicate a singer actually singing behind and below you—at least in the next few years. There is a certain experience you can only get from watching a live play. There’s a connection between the audience and cast—a human touch—that a screen simply can’t replicate. The applause after the finale was emphatic and went on for so long that I could’ve finished my Data Structures homework before it ended. All jokes aside, the Players absolutely deserved it for this phenomenal performance. The Demon Barber is not done yet, and you can watch him give his victims the closest shave of their lives on April 18, 19, and 20 at 8 pm in the RPI Playhouse. I haven’t had a night this much fun in a while, and I’d highly recommend going to see it before we all perish during finals week.